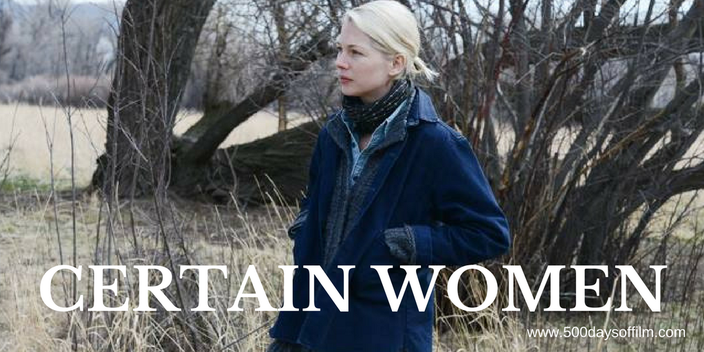 Certain Women follows four women striving to forge their own paths amidst the wide-open plains of the American Northwest: a lawyer (Laura Dern) contending with office sexism and a hostage situation; a wife and mother (Michelle Williams) whose determination to build her dream home puts her at odds with the men in her life; and a young law student (Kristen Stewart) who forms an ambiguous bond with a lonely ranch hand (Lily Gladstone). The first thing you notice when watching Certain Women is the sound of a train approaching. As the train comes into view so too do the stunning plains of southern Montana - a landscape that challenges the very boundaries of your movie screen. Sound and landscape have an important role to play in Kelly Reichardt’s beautiful, intimate and powerful film. Certain Women is visually stunning, its evocative soundscape simply wonderful - from the unzipping of a tent, to the sound of horse hooves on snow and ice. Sound and vision both add to the movie's sense of melancholy and loneliness. Into this backdrop emerge four women - each with a deeply poignant and fascinating story to tell. Certain Women is based on some of the short stories in Maile Meloy’s book Both Ways Is The Only Way I Want It. Reichardt’s certain women then intersect in subtle yet meaningful ways - through the law, the land and each other. First we met lawyer, Laura (Laura Dern), then Michelle Williams’ Gina and finally Kristen Stewart’s young lawyer, Elizabeth, and Lily Gladstone’s rancher. Each woman struggles with her flaws and ambitions, with her emotional connections and her place in the world. Like Reichardt’s previous films (I particularly love Wendy and Lucy), the action is muted and events move slowly. However, Certain Women’s unhurried pace belies its power - for in these moments lie many compelling, intimate and insightful observations. Of the three stories, all brilliantly told and impressively portrayed, the final tale between Elizabeth and the rancher was my favourite - largely down to Gladstone’s superb and truly heartbreaking performance. Have you seen Certain Women? If you have, what did you think of Kelly Reichardt’s film? Let me know! Leave me a comment in the box below or via Twitter or Facebook!